She's the richest of all the young songstrels and popsters on the UK music scene, according to the Sunday Times Rich List. 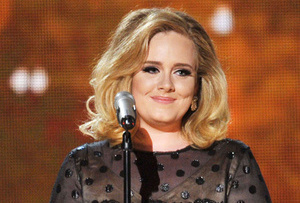 Beating Cheryl Cole, Leona Lewis and Katie Melua, London-born Adele has amassed a personal hoard worth £20m. And it's all happened incredibly quickly. Adele earned some £14m of this loot over the past year alone, making her the fastest climber on the wealth ladder of all the UK's bright, young things. Interestingly, of the top ten wealthiest young musicians, eight are women, with only RnB cinger Craig David and Scottish indie crooner Paolo Nutini representing the Y chromosome. Over in the world of film stars under 30, men dominate the top spots. In poll position, Daniel Radcliffe with a fortune of £54m - not bad for a 22 year old. In second place, Twilight heartthrob Robert Pattinson. In modelling, Keira Knightley has the most moolah, while Radcliffe's co-star from the Harry Potter franchise Emma Watson, who is also a model for British luxury brand Burberry, comes in third with £26m.